DogTime’s Road to Rescue program salutes Tampa Bay Beagle Rescue, dedicated to creating a better life for Beagles and Beagle mixes in need. Tampa Bay Beagle Rescue (TBBR) was started in 2003 by three Beagle lovers and rescued 27 dogs in the first year. TBBR has continued to grow, adopting out 152 Beagles in 2006, 253 Beagles in 2007, and 307 Beagles in 2008. We are an all volunteer, foster-based 501(c)(3) organization and today have a total of 48 fantastic volunteers/fosters. Tampa Bay Beagle Rescue is dedicated to rescuing and rehabilitating abused and neglected Beagles and Beagle mix dogs and finding them permanent, loving homes. The majority of our Beagles come to us from kill shelters throughout Florida, although we also have contacts and receive dogs from Alabama, Georgia and Louisiana. Once a Beagle arrives at TBBR it is placed in one of our foster homes or at our overflow kennel, until a foster home become available. Depending on the Beagle’s condition and if it has received any vet care or vaccines at its origin shelter, it will receive a bath, have it’s ears cleaned, nails cut, receive a vet check, rabies, bordatella, and DHLPP vaccinations, microchip, and heartworm test. If necessary, it will be spayed/neutered and receive treatment for heartworms. We usually post photos and a description of each Beagle on our web site within 24 hours of intake and we encourage our foster families to work on housetraining, behavior training, and posting their comments and observations on the Beagle’s web page. We usually hold bi-weekly adoption events at an off-leash dog park where pre-approved families and their other pets can come and meet and play with 15 or more of our Beagles. In between adoption events we will have private meet-ups with pre-approved applicants with a particular Beagle they are interested in adopting. We are also proud to be a continued resource for families that adopt from TBBR and also anyone who is having a problem with their Beagle. 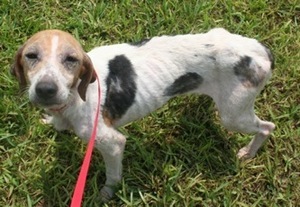 Aspen is a female Beagle mix who was found abandoned in the woods. When she was dropped off at a rural shelter in Florida, a wonderful worker knew she would be euthanized because she was in such poor medical condition and called TBBR. We had a volunteer on the road early the next morning to rescue Aspen. I had never seen a dog that was that emaciated and still alive, but she certainly had a strong will to live and we were going to give her that chance. I gave her a bath that evening, which did nothing for her overwhelming odor. Aspen was at the vet the next morning where they found she had a variety of intestinal parasites, was heartworm positive, had mange, was anemic, seriously undernourished and underweight and had a low thyroid level. He also noted that the wear on her teeth was typical of a dog that had been confined in a cage and chewing on the bars for a long time. We fed her a diet of small amounts of puppy food several times a day and she had a ferocious appetite. Once we got rid of the worms she started to gain weight and you could see she was going to be a real beauty. At the annual blessing of the animals at our church, Aspen met our pastor, Father Len. You could see he was taken by her and amazed when I showed him Aspen’s before photos. He even pointed her out during the service and said Aspen was up for adoption and needed a new home. After the service we stayed and chatted with some of the congregation and Fr. Len kept coming over and petting Aspen. Someone would take him away to show him their dog or cat and he would always come back to Aspen. That next week we received an email from Fr. Len saying he would like to meet Aspen and possibly adopt her. We had planned several sleepovers to see how she would adjust, but after the second night Fr. Len said she should just stay. Fr. Len had Beagles in the past so he has the attitude and aptitude to help Aspen reach her full potential. He gives her plenty of exercise plus Aspen spends some time every day with him at his office. 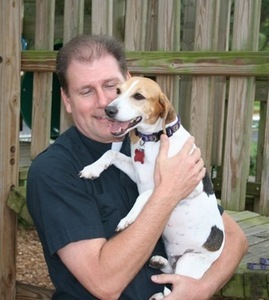 She is the talk of the parish and a great ambassador for the Tampa Bay Beagle Rescue.